This wire rope for dockside cranes is a step up from our 8×19 construction rope in terms of its strength, but offers the same integral benefits for its intended applications. 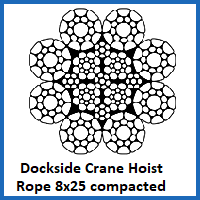 The dockside crane hoist rope 8×25 compacted construction is manufactured to order and built to last, it is just one of the crane rope options we offer. Like many of our wire rope products, this 8×25 construction doc kside crane rope is made using drawn steel wires which have undergone galvanisation to slow down the process of corrosion. So in addition to the crush-resistant, compacted configuration of the wires, you can be confident in the long term integrity of this rope in a marine environment. 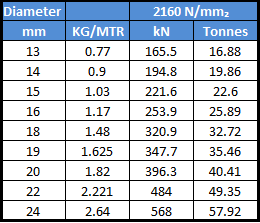 Lifting safety is further assured thanks to the high breaking load, which starts at 273kN for the rope of just 16mm in diameter and creeps upwards to peak at 856kN on the 28.6mm example. You can find 8×19 construction compacted wire rope for dockside cranes on our site, as well as alternatives that are fit for container cranes, mobile cranes and several other variants of this type of equipment. The properties of each vary, so check the specifications carefully to ensure you are getting the right product. Need Quick Answers to Wire Rope Questions? Seek the assistance of our experienced wire rope experts by calling 01384 78004 or sending an email from our site. We can help you choose the right dockside crane rope, conjure up a quote or take your order today. 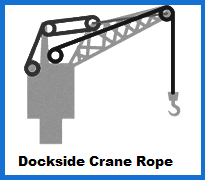 Dockside Crane Hoist Rope 8x25 Compacted Construction Overall rating: 5 out of 5 based on 6 reviews.